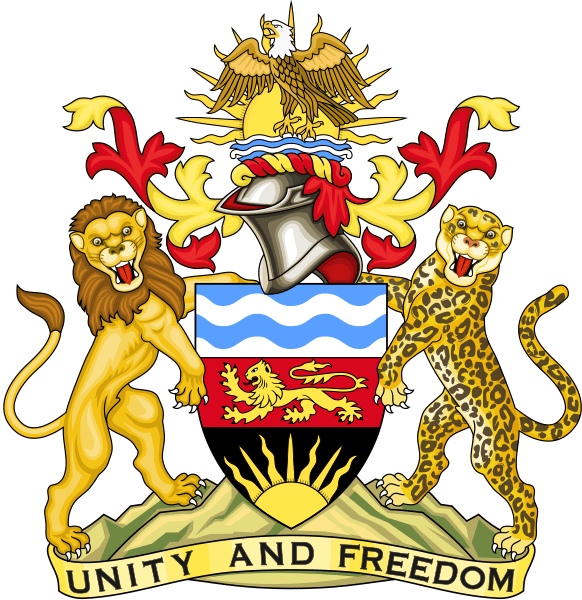 Description: Coat of Arms of the Republic of Malawi, adopted upon independence in 1964. 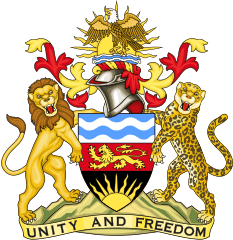 A Royal Warrant granted by Queen Elizabeth II, reads: Arms: Tierce per fess: 1. Barry wavy of four Azure and Argen; 2. Gules, a lion passant Or; 3. Sable, a rising sun radiant Or. Crest: On a steel helmet to the dexter, lambrequined Or and Gules, a rising sun radiant Or, charged with a fish eagle hovering above two waves Azure, proper. Supporters: A lion on the dexter and a panther on the sinister proper. Compartment: Mount Mlanje proper. Motto: UNITY AND FREEDOM, in black lettering on a ribbon Or. Credit: Own work, in accordance with the blazon (heraldic description) above. Author: Sodacan This vector image was created with Inkscape. This page was last modified on 23 February 2017, at 21:09.